Silicon Valley S5 E3: "Chief Operating Officer" review – AiPT! I still don’t find myself missing Erlich. With both Gilfoyle and Pied Piper itself on the line, Richard must choose which to save. And it’s time for the company’s most unsung hero to shine this week as Jared tries to play matchmaker to Richard and another tech CEO as Pied Piper hires its new COO. Jared introduces Richard to Dana, whose company Quiver is apparently giving Oculus a run for their money. Jared and Dana are old friends from when they were both working at Hooli. Though the latter appears shockingly even more introverted and antisocial than Richard, he eventually gets around to inviting the Pied Piper duo to some corporate party he’s less than enthused about throwing. Despite Jared’s aggressive efforts, Richard fails to connect with the awkward Dana. But he does hit it off with Dana’s COO, Ben (guest star Ben Koldyke). A former coder himself and an admirer of Richard’s, Ben is quick to invite Richard to lunch. Word has it though that Ben left Oculus for Quiver under less than professional circumstances. Richard and Ben meet in what feels like an illicit affair where Ben is cheating on Dana. With “radical candor,” Ben confides in Richard that he didn’t tell Dana about their lunch because he’s not happy with how stagnant Quiver’s become. Ben wants to switch teams again and become Pied Piper’s COO. But before the matter can be discussed further, Dana happens to also show up at the same restaurant. Ben sneaks away to avoid detection and Richard joins Dana for lunch. Meanwhile, at Pied Piper, Dinesh is searching for a new home since he spent so much money on his Tesla that got wrecked last week. Unbeknownst to Dinesh, the new roommate he found from the office is Jeff, Hoover’s mole from Hooli. After Jeff gets him drunk, Dinesh spills the beans about how Gilfoyle illegally hacked into the smart fridges in last season’s finale. And, in no time, Gavin wants to suddenly partner with the smart fridge company, promising to cut down their server bills in exchange for helping him destroy Pied Piper with a $10M lawsuit for hacking the fridges. Hearing about the suit, Richard accuses Gilfoyle of failing to properly bleach the system. When meeting with Ben for another assignation — this time at midnight — to discuss the COO position, Richard tells Quiver’s COO all about how Gilfoyle went rogue and hacked the fridges on his own. Ben encourages him to sell out Gilfoyle for the good of the company. But Jared, ever the moral compass, says it isn’t like Richard to throw his friend under the bus and urges his boss to tell Dana the truth that he’s been sneaking around with Ben behind Dana’s back. When he goes to do just that, however, Richard is ambushed when Dana says Ben’s already told him everything, at least Ben’s version that makes Richard the bad guy in the situation. Much more assertive than we’d previously seen, Dana tells Richard off, gets on his motorcycle, and rides away. Turns out he’s only been low-energy because of a cold. Jared gets a mysterious call from Jian Yang, who tells him to come back to the house that Aviato built ASAP, the house Jian Yang kicked them all out of last week. Richard and company meet with the fridge company execs and threaten to expose that the fridges are secretly recording their customers. The fridge people aren’t aware of any recordings but cave immediately, admitting it was Gavin who engineered the lawsuit. Jared offers them a deal memo that says Pied Piper will fix the fridge security issue and update their system, which will lower server costs and improve security, in exchange for dropping the suit, an agreement the fridge folks are happy to make. That deal was Jared’s idea, meaning he once again proved Pied Piper’s MVP by saving the company without destroying Gilfoyle in the process. Ben presumptiously arrives ready to start work, but Richard hasn’t hired him. Instead, Richard names Jared COO. But there’s no time to celebrate as they now suspect a mole tipped Gavin off about the fridges, news Dinesh excitedly shares with Jeff…the spy. 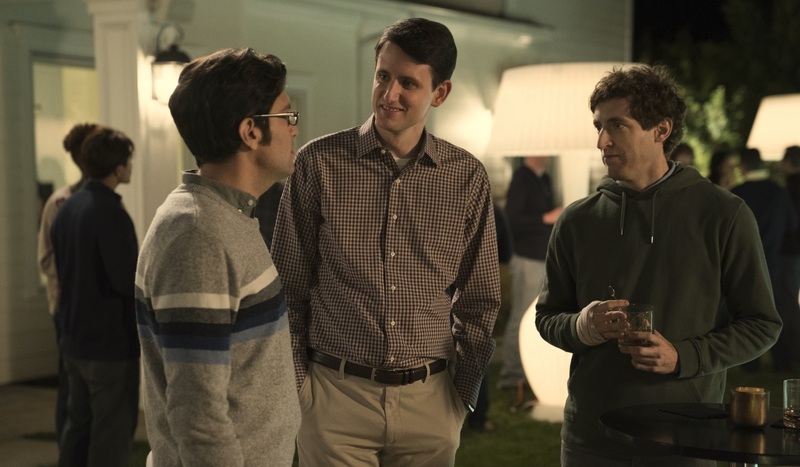 The real highlight of this episode as well as all three of the episodes this season is Zach Woods’ Jared, who’s always been the conscience and heart of the Pied Piper team as well as its most unsung hero. Jared has gradually emerged as my favorite character on the show as he continues to serve as Richard’s best advisor. Unfortunately, we don’t learn any new information about Jared’s ever-surprising and weird past this week, but it’s great to see him rewarded with a promotion for his valuable service to the company. Once again, Monica and Lori sit this one out. And even Jian Yang and Gavin aren’t given much to do this outing. One bit of plotting that felt rushed is Jeff going from agreeing to move in with Dinesh to them living together in the span of a few short scenes or, like, a day. I understand why that time had to be compressed to tell the story but, in that case, maybe they could have introduced Jeff in the season opener as one of the few employees hired before the Sliceline and Optimoji acquisitions. Either way, he’s kinda a minor plothole anyway in episode 2 when the entire team briefly quits as it makes no sense for a mole to quit too. It also seems unlikely Ben would have just shown up for work without any official hiring. My only other minor quibble is the subplot involving Gilfoyle’s super loud and annoying updates about his Bitcoin investments. I’m glad Silicon Valley is addressing Bitcoin, but it makes no sense for even timid Richard to not order Gilfoyle to knock it off, and I’m hoping for a more substantive response to the Bitcoin phenomenon in the future. Silicon Valley S5 E3: "Chief Operating Officer"
I have a few nitpicks with some of the plotting but, overall, this was another solid episode. And I still don't find myself missing Erlich.